Is the Barbee hotel in Warsaw Indiana haunted? 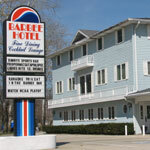 The Barbee hotel was built in the early 1920's. It was a very popular place to stay for the more wealthy of travelers and is famous for being one of the favorite resting places of the gangster, Al Capone. It is still open today as a hotel. The hotel was considered a very high-class resort during Al Capone's time. He stayed in the hotel frequently, often clearing out all the guests so he could stay in seclusion. He always stayed in room 301 at the back of the hotel. When cleaning the rooms employees have smelled cigar smoke and when they investigated it, they found it to be coming from room 301! The bartender who has worked there for years has seen an old man sitting at one of the booths on several occasions. When she goes to get someone, the figure disappears. People have reported hearing footsteps on the stairs, and in the halls above the dining area. Many parties when taking their picture will line up on the stairs. There are several pictures on the wall where you can see orbs of light in the background behind the group.